Naki’o, a mixed breed dog from Nebraska, has become the first dog fitted with four prosthetic limbs. This achievement was accomplished by US company Orthopets, which specializes in artificial pet limbs. Naki’o lost his limbs and part of his tail to frostbite when he was abandoned in a cellar as a puppy, but now, thanks to a successful operation, he can run and play freely like other dogs. Naki’o was rescued by veterinarian assistant Christie Pace, who put together a fundraiser to raise enough money for two back leg prosthetics, which cost between £600 and £2000. However, after seeing his condition, Orthopets opted to do his front limbs free of charge. ‘When we saw how good he was doing with his back leg prosthetics and how he was struggling to use his front legs it was very simple to say, “we gotta keep with him,” said owner of Orthopets Martin Kaufmann. Kaufmann started the business in 2007 with his wife and partner Amy and designs and fabricates custom prosthetic limbs and orthotic braces for animals. However, Naki’o’s need for four limbs did present certain challenges. Initially they tried a prosthetic without revising Naki’o’s bone structure, but that was not going to be a long-term solution. A few months after the second rear prosthetic device was in place, they began fitting Naki’o with devices for his front legs and now he can function just like any other dogs. Watch a short video here to see Naki’o’s story in full. WARNING: It may break your heart. This is really awesome! 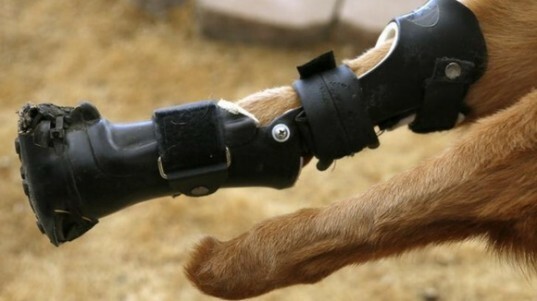 It gives me hope for humankind that we care enough to make all kinds of animal prosthetics now!! It's truly amazing!! Way 2 go Naki'o!! amazing and happy for Naki’o and good work Christie Pace. 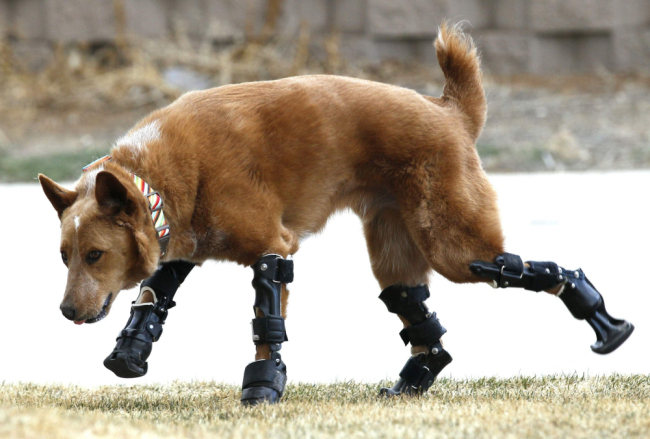 Naki'o, a mixed breed dog from Nebraska, has become the first dog fitted with four prosthetic limbs. This achievement was accomplished by US company Orthopets, which specializes in artificial pet limbs. Naki'o lost his limbs and part of his tail to frostbite when he was abandoned in a cellar as a puppy, but now, thanks to a successful operation, he can run and play freely like other dogs.